FINALLY - The back of book blurb for Promise Me Light is HERE!!!! It wanted Ryder Delaney. My best friend. The bad boy. The one person who could fight like no other and love me like no one else. He was the father of my baby. I watched him walk away one hot summer day and I prayed he would return. I needed him like I needed air to breathe and water to drink. Without him I was lost. A light without her darkness. 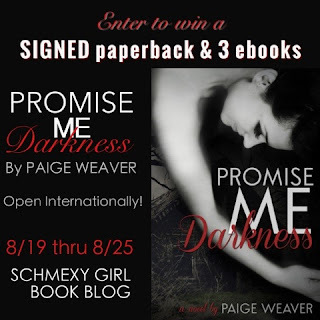 Schmexy Girl Book Blog is giving away a signed copy of Promise Me Darkness and three ebooks. Yay! Go check it out! The wonderful ladies at The Book Hookup interviewed me about writing and my books. Check it out! Four months ago today, Promise Me Darkness was released out into the wild. Since then it has been a crazy ride. I didn’t know what to expect when it hit Amazon and the other sites. Would anyone read it? Would anyone like it? I was both excited and terrified to know strangers would be reading my book. Promise Me Darkness was my baby, my first born, and like any parent, I wanted my child to be accepted and well received. I remember telling my husband, "I'll be very happy if just a few people read and like it." To me, having a few people say they loved it seemed like an enormous achievement. I told someone that my ultimate dream would be to sell a hundred copies in one month. That sounded huge. One hundred people read my book! Four months later, Promise Me Darkness has sold around 90,000 copies. To think that it sold 100 copies the first few hours of release is beyond anything I could imagine. Never did I believe that would happen. Never did I imagine the responses I would receive by fans. It still blows me away. So I worked on Promise Me Light frantically, listening to readers beg and plead for me to hurry and finish it. I wrote around the clock, sometimes for twenty hours a day, getting only four hours of sleep a night. (If you were one of the unlucky ones that received an email from me in the wee hours of the night, I apologize now for my crazy, makes-no-sense responses.) I survived on coffee, coffee, and more coffee. I took care of kids, answered emails, wrote and tried to get some sleep in between it all. I didn't cook and I didn't clean. I hardly left my house. But I wanted to get PML in my fans' hands. I'll admit - it was difficult for me to write. There was so much emotion in the book that I felt everything. Every time my characters were sad, scared, or worried. I felt it all. I cried as I wrote the ending. I was a blubbering mess and I don't cry. Ever. I had to say goodbye to Ryder and Maddie and they had given me so much. ~~~It picks up two weeks after Promise Me Darkness ended. 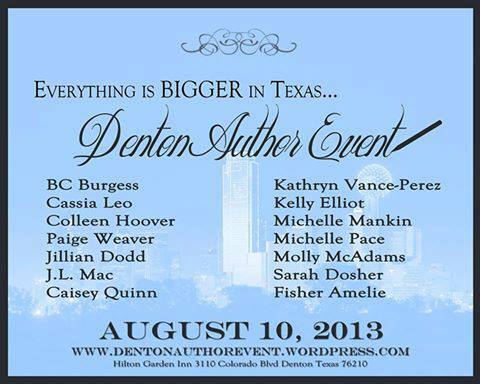 ~~~You will see more of Cash and Gavin in the book. ~~~It has an HEA and is the last book for Maddie and Ryder. (Unless I get bored one day and write an entire book from Ryder's POV. I love getting in his head because he's sooooo....bad.) I would like to write a book for both Cash and Gavin in the future. ~~~The preorder is available on Amazon for both the paperback and e-book. The synopsis (description) and the cover are currently underway. An audio book will also be released at the same time as the book, from what I understand. ~~~The cover will be revealed September 9th. ~~~And just like in Promise Me Darkness, the main theme is friendship and love. Stick together, love one another and never give up. That's the motto of this book.